A unique and special highlight will take place in Sölden on the 12th April 2019. Against the impressive backdrop of Rettenbach glacier, Glacier Spectacle Hannibal lets you experience the famous Alpine crossing of the Carthaginian commander in a spectacular way. The unique natural stage, elaborate light and pyrotechnics, and 500 actors make Hannibal a show that has no equal in the world. 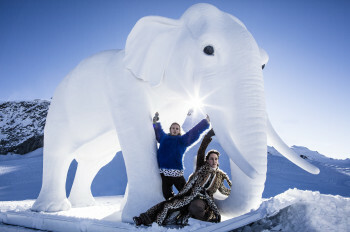 © Ötztal Tourismus/Ernst Lorenzi 37 elephants crossed the Alps along with Hannibal. The tale is as old as it is famous. In 218 BC, Hannibal crossed the Alps in only 10 days. Him, his 60,000 men army, and 37 elephants defied steep mountainsides, raw weather conditions, and avalanches, and in the end defeated Italy. Although Hannibal had the superior military, he refrained from conquering Rome. This decision was his downfall. Under Scipio, the Romans took advantage of Hannibal's hesitation, and eventually defeated him in the Battle of Zama. Rome became the strongest power in the Mediterranean, while the African Carthage sank into insignificance. This exact story is brought back to life in Sölden on the 12th April 2019 - almost 10,000 ft above sea level! Rettenbach glacier is the backdrop of this spectacle, spreading out on 185 degrees as the largest natural show stage in the world. No movie screen can keep up with that. Snow groomers, planes, and helicopters are part of the show alongside actors, paragliders, and avalanches. Starting at 7.30 pm, snow groomers turn into elephants in the dusk, 150 ski teachers wag down the slopes as African desert tribes, and Hannibal himself thrones on a moving tower. Faraway scenes are brought closer to the spectators with a giant video wall next to the 30 ft high step pyramid. The story is told by the Austrian actor Harald Krassnitzer. © Ötztal Tourismus Around 500 people and machines are part of the spectacle. To make sure the spectators don't balk a single detail of the spectacular show, a new, more generous and overseeable auditorium has been arranged. If you don't want to miss out on the Glacier Spectacle, you can choose between three different ticket categories: standing (€47); a place inside of Sölden Lounge with a seat, drink, and buffet; or inside Red Bull Organics Lounge, with a lounge seat on the new deck. All of the tickets include a shuttle bus from Sölden to the glacier and back. Tickets are available at the tills of Giggijoch- and Gaislachkoglbahn lifts as well as online.